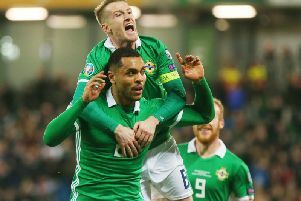 Northern Ireland midfielder George Saville believes Josh Magennis’ late winner against Belarus on Sunday will prove “crucial” to their Euro 2020 qualifying hopes. Magennis struck with three minutes to go at Windsor Park to send the Green and White Army three points clear in the nascent Group C table following on from Thursday’s 2-0 win over Estonia. Northern Ireland can enjoy the view from the top until at least June and the next round of fixtures, and Saville believes Magennis’ goal has made all the difference when it comes to confidence and momentum. “Mentally it is good for us,” the Middlesbrough man said. “We can sit on that for a couple of months now, but we know we’ll have to go again in the summer and push on to pick up another six points from those two games. 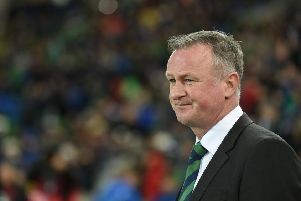 Picking up points early is as basic requirement for Northern Ireland given they play Estonia and Belarus away in June before much tougher home and away fixtures against group favourites Holland and Germany. The late winner was no more than Northern Ireland deserve on the night, but they were in danger of dropping two points after Igor Stasevich’s deflected shot cancelled out Jonny Evans’ 29th-minute opener almost immediately. “We never do it easy, but the objective this week was six points and we’ve done that,” Saville added. “I feel like we dominated the game, they had that one chance and it was a fluke really. Northern Ireland had dominated games in similar fashion during last year’s Nations League, but those performances all went unrewarded. Saville said those experiences had not dented Northern Ireland’s confidence. “That’s the thing with this group, we have massive belief in ourselves as a team,” he said. “We pushed on and thankfully we got what turned out to be the winner in the end. “Maybe it was better to have finished the way it did with the late winner.